Tryouts are free, but please register in advance. All sessions will be held at Rocky Mountain Middle School fields. Tryout Dates and Times are according to Birth Year (see information below). Interested players MUST attend tryouts, no exceptions. Please arrive 30 minutes before your scheduled time. 1. I am already playing on an HVSC team. Do I still need to tryout? Yes, you still need to register and attend tryouts every year. Participation in the tryout provides the best opportunity to be aligned with the team that will match your age and skills. 2. Do I need to attend the entire time? Yes. The first hour of tryouts typically evaluates current skills through participation in several individual drills and small 1v1 and 2v2 style games. The second hour of tryouts you will be rotated through several small matches to evaluate your field playing abilities. Missing time will mean missing a chance to show your overall capability. 3. What if I cannot attend the tryouts? Tryouts are mandatory, so every effort to be there should be made. If a player MUST miss tryouts, coaches/trainers may arrange to have he/she undergo an individual tryout at a different time. However, team placement may be affected. 4. What time should I arrive at the tryout and what if I arrive late? You should plan to arrive 30 minutes prior to your tryout time. There will be a check-in process that will take a few minutes. If you arrive late you will still be able to enter the tryout process, but there is a possibility that you will not be evaluated thoroughly. 5. How long is the tryout session expected to last? Can I drop off and pick up my athlete? Tryout sessions are expected to last about two hours. You may drop your player off, but we would strongly encourage you to stay, assist with their check-in, and observe the tryout process. Volunteers will be on hand to answer any questions about the club that you may have while your athlete participates. 6. If I forget to register can I register on-site? Yes, on-site registration will be available. However, in order to ensure we are prepared with enough staff and equipment , it would be greatly appreciated if you register in advance. 7. Do I need to bring anything to the tryout? You are not required to bring any equipment to tryouts. A suggestion would be to treat it as a game/practice situation and wear appropriate soccer shoes (cleats) and shin guards. Also please bring water. If you do not have these items, do not worry. Just bring your excitement to play and a good attitude. 8. Can I choose to have my player play up or down with kids in their grade level? No. US Soccer and UYSA made changes to the team formation process in Fall of 2016. Teams are formed by birth year, regardless of grade (see below). In very rare occasions, when ability is the primary factor, the club training staff and tryout evaluators may choose for a player to join an older team. In the vast majority of cases, players need to be playing in their correct age group for proper development to occur. 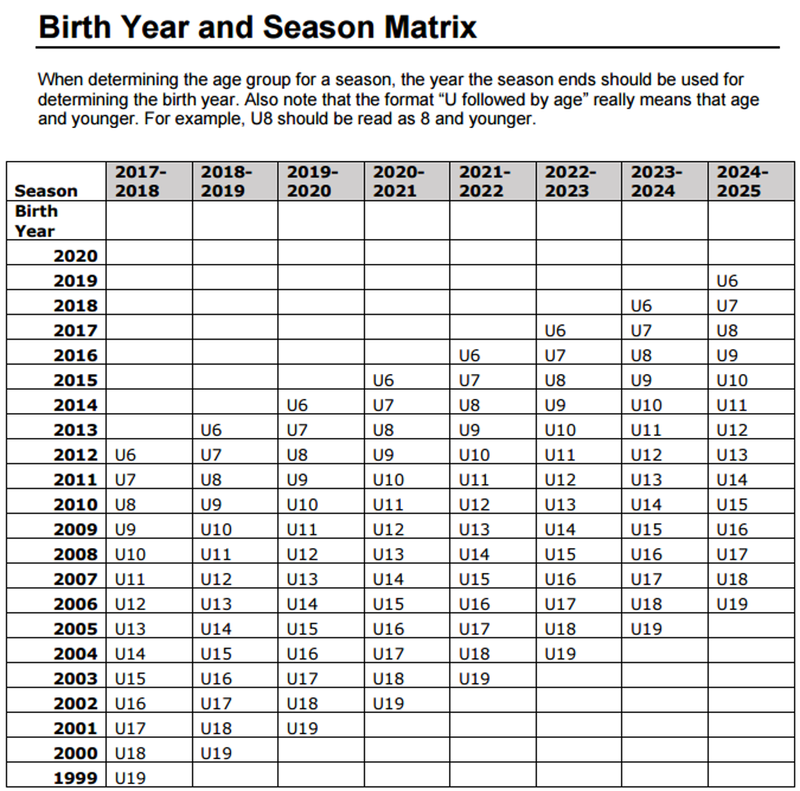 US Soccer has announced a change in the classification of age groups from the School Year (August 1-July 31) to Calendar Birth Year (January 1-December 31). In accordance with UYSA and US Soccer, HVSC teams are now formed based on birth year, not school year. For example, in the past U14s were 04s and 03s who were in eighth grade. After the change the 04s are U14 and the 03s are U15. The US Youth Soccer State Associations, including Utah, are proceeding with implementation in 2016. Thus, commencing immediately following the Spring 2016 season, and before UYSA’S official try-out start date, UYSA affiliated clubs and leagues will need to transition to the Calendar Birth Year in preparation for the Fall 2016 soccer season. In addition, our national governing body, US Soccer, has announced that the following formats of play are to be adopted as a best practice by August 2016 and will be mandated of all youth member organizations affiliated with US Soccer, including UYSA, by August 2017. In the coming months, the UYSA Board of Directors will make appropriate changes to our rules, programs, tournaments, etc. When finalized, we will be communicated to you as timely as possible. At this point, UYSA simply wishes to relay the changes to you as quickly as possible for your planning purposes. The age group in which a child plays competitive soccer is determined solely by their birthday. There are only a few exceptions to this based upon the UYSA and HVSC Policies (such as Playing-Up). The chart below will help you to determine what age group is effective for the seasonal year that begins in the Fall of 2016.